Our mission is to continually ask ourselves how we can better serve our customers today than we did yesterday! 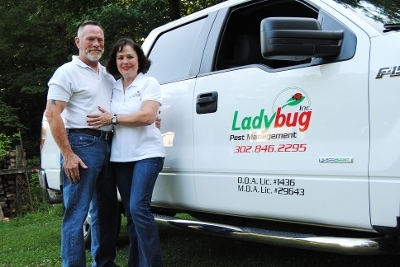 Ladybug Pest Management, Inc. is a female and veteran owned business. Family is a very high priority to us in our lives and in our business, so we take that to heart while servicing all of our customers and their needs in resolving any of their pest control problems. Frank C. Honess, III has a total of 23 years customer service experience with Honess Construction & Backhoe Service, Inc. He has also worked as a Service Manager for one of the largest pest control companies in the U.S. (Orkin Pest Control Company). He is certified, licensed and insured to conduct business and perform pest control services in Delaware as well as in Maryland. Sandy (“Ladybug”) Honess has over 25 years of office administration experience and customer service involvement while in the legal arena, as well as other office environments. She enjoys working with the public and helping customers and clients with any of their needs. Trained and professional pest management technicians who are able to determine which combination of methods would best benefit each individual customer and circumstance. We are all highly skilled observers who can easily distinguish between existing and potential problems. Knowledgeable and understanding pest professionals who can and will help you find ways to make your home or business a pest free zone. Our employees are compassionate, receptive individuals who will carefully listen to their customers and help them with all of their pest control needs. Our technicians perform their work carefully, delicately, and in accordance with your schedule and/or without disrupting your household. If you think that your property may be exposed to any type of pest such as bed bugs, ants, termites, spiders or rodents, make sure you call to or go online to make an appointment with your dedicated exterminators in Delaware so that we can promptly take care of all of your pest control needs! We look forward to hearing from you and being able to service your personal or commercial residence!